Warwick Valley Central School District staff work together to foster an educational program that is challenging and meaningful for students. The district recognizes that all students do not learn in the same way. Staff are encouraged to be lifelong learners and to always remain cognizant of each child’s individual learning style. The district offers an extensive in-service and professional development program, which includes a formal mentoring/internship program. Teachers and administrators employ a variety of instructional strategies and practices to implement the educational program. When visiting a classroom, a parent may see various strategies and practices at work, such as team teaching, peer tutoring and differentiated instruction. 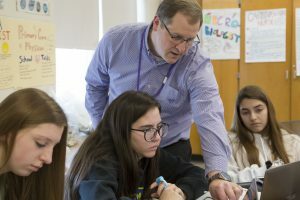 The New York State Standards-based curriculum is reviewed on a regular basis to ensure its focus on basic academic skills, with emphasis on problem-solving, critical thinking and good study habits. Elementary students receive regular instruction in art, music, physical education, health and library/research skills. In addition, youngsters may choose to participate in a variety of clubs and extracurricular activities. Warwick’s elementary schools consistently exceed similar Orange County school districts on the New York State Assessments. Our K-12 music program is highly recognized at both the county and state levels, with instruction in band and strings beginning in grade 4. The Warwick Valley Middle School is home to just over 1,000 students. Fifth and sixth-grade students’ schedules rotate to offer blocks of instruction for academic subjects. In the seventh and eighth grades, students follow a 40-minute, nine-period day. To retain the small school feel, students are assigned to a team or hall. Beginning in grade 7, honors courses are offered in English, math, science and social studies. Students studying a foreign language may choose from French, Spanish and Mandarin Chinese. More than 1,300 students attend Warwick Valley High School, from which approximately 95 percent graduate with a Regents diploma. Our students consistently score well above the county, state and national averages on standardized tests. As part of their well-rounded educational options, WVHS students can also choose from dozens of clubs and a variety of varsity athletic teams. Students may also take classes in the technical and occupational career programs at the Orange-Ulster BOCES (Board of Cooperative Educational Services). In addition to their many musical performances, both our high school and middle school produce dramatic and musical plays every year. In an effort to challenge and meet individual students’ academic needs, the district offers Honors classes in the following subjects: English (8-12), Social Studies (8-12), Science (8-12), Math (7-12), and foreign language (9-12). Entrance to Honors begins in middle school and is based on academic achievement, NYD assessment scores, and, depending upon the subject, Universal Screening scores. Continuation in Honors through high school requires the student to maintain a passing grade in every marking period and/or earn a final grade of 85% or above. Please call the middle school or high school guidance office for more specific information regarding your child’s enrollment in the Honors Program. Warwick Valley Central School District continues to develop and implement a balanced assessment system that accurately reflects student progress. While monitoring student progress is an essential part of teaching, WVCSD recognizes the need to maximize instructional time. A key strategy of this objective is to develop meaningful performance-based assessments to replace some of our more traditional assessment practices. WVCSD’s strategic planning process will include a close review of the district’s current approach to student assessment to ensure a balanced approach. The value in assessments is in the use of authentic measures to inform instruction. At a 2013 Board of Education Work Session, then-Assistant Superintendent for Curriculum & Instruction, Dr. David Leach, presented the district’s Balanced Assessment Plan.